Fully machined upper and 80% machined lower. No FFL required. Parts are machined to mil spec so that all accessories will fit. These are made from a forged 7075 T6 Aluminum. 80% lower receiver is not a complete receiver and still requires machining to be completed. 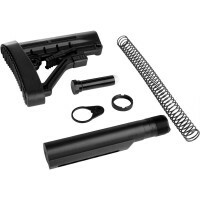 AR-15 80% lower and upper receivers set, black anodized.AR15 80% machined lower and fully machined upper. No FFL required. Parts are machined to mil spec so that all accessories will fit. The set is made from a forged 7075 T6 Aluminum Magwell is broached for a perfect fit. This set is bead bla..